From Star Wars: The Force Awakens the First Order TIE Fighter is making its way to the Bandai Star Wars Plastic Model lineup! 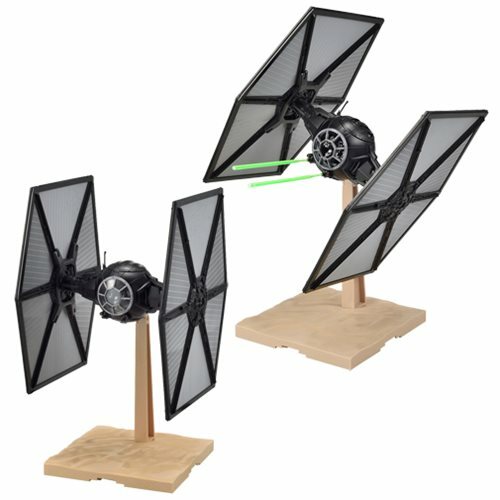 The Star Wars: The Force Awakens First Order TIE Fighter 1:72 Scale Model Kit features intricate cockpit detailing and the viewport utilizes clear parts or a frame. Use the included dedicated display base and laser parts to recreate iconic scenes from the movie! Set includes dedicated display base, 2x laser effect parts, 1:72 seated pilot(unpainted), view port parts (clear and frame), 1x water-transfer decal, a marking sticker, and 6x runners. Ages 15 and up.